TUC: Pay Growth Down Again! “Wage growth has slowed again. Boosting pay packets should be a priority for the government, but ministers are failing to act. “We need to get the economy moving again. The government should put the minimum wage up to £10 and give all public servants a proper pay rise. The “Hampshire and Isle of Wight Health & Care System STP Delivery Plan Final Draft” was published 21 October 2016. 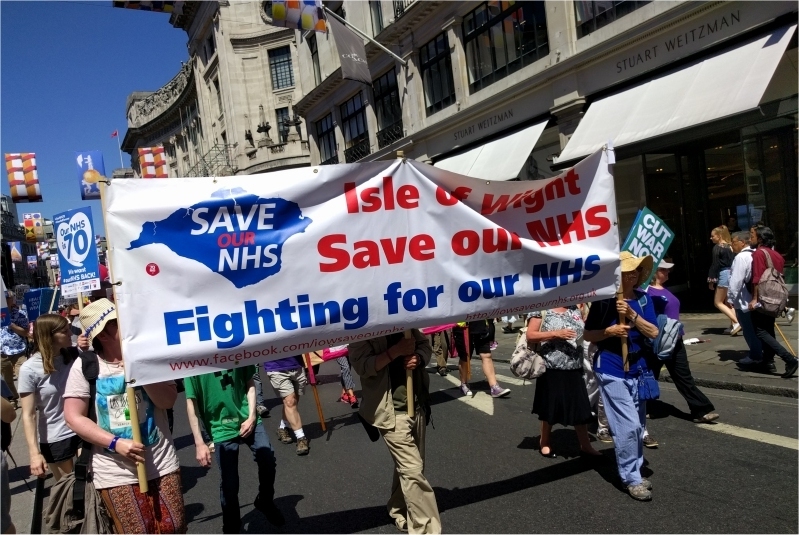 It is a long (42 page) and sometimes complex document, so we’ve decided to try and summarise it in simpler language, so everyone has an understanding of what is being planned for healthcare on the IOW. I encourage everyone to at least look at the full document which can be found by clicking here. In it’s initial summary it states that, to address challenges they are changing how care is delivered, driving productivity and efficiency, transforming the workforce, investing in digital transformation, and redesigning the way agencies work together. On page 5 it explains that the key components will be to design a new system of care to address challenges. Citizens will be encouraged to proactively manage their own health, and access support in the community. On this page it also mentions people from the isle of wight may have to travel further and they will try to minimise the impact of this, this shows right from the beginning services being lost from the Island has been on the cards. On page 6 they discuss “Place Based systems” of integrated care”, “my life a full life” being the organisation for the Isle Of Wight. It is vanguard pilot scheme and the island bid to be chosen to have the pilot. Read more about this at this link. To upgrade prevention and early intervention and self care. To accelerate the introduction of new models of care. Under Governance on page 9 it says under “Governance”, that “The Hampshire And Isle Of Wight Health and Well Being Group” has been set up to “provide oversight of STP, and setting the overall direction”. P10 talks about the “Delivery Structure” and is best described using this picture from the document. Section 2 talks about “The Delivery Programme” There will be 6 core programmes, and 4 Enabling Programmes. It’s objective is to raise life expectancy and reduce dependency on health services by radical upgrade in prevention, early intervention, and safe care. The objective is to improve the health and independence of the population through accelerated introduction of models of care. Also to ensure sustainability of Gps within wider integrated healthcare. All to be delivered by the different Vanguards in place across Hampshire “My Life a full Life” being ours on the Isle Of Wight. The objective is to ensure no patient stays in a bed longer than thier condition and care programme demands. To improve discharge planning and flow by investing in capacity to care for patients in more appropriate settings, also to ensure every patient has a discharge plan. This is a collaboration between University hospital Southampton, Portsmouth hospital Trust, IOW NHS Trust, and Lymington hospital to improve outcomes reduce variations, and lower cost. 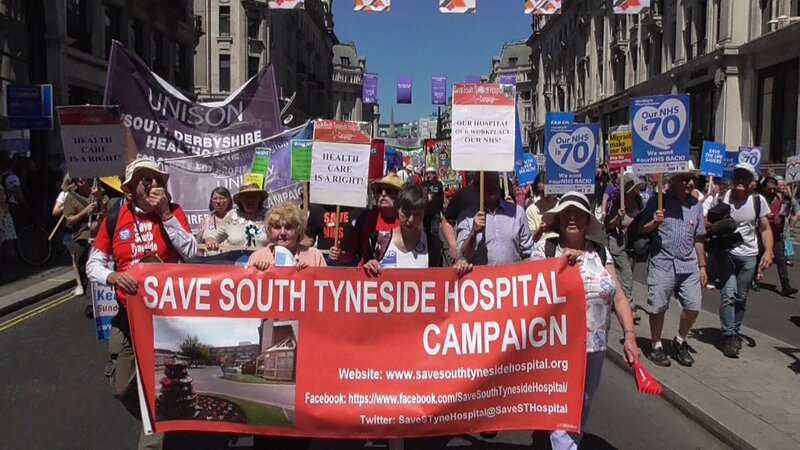 The objective is to deliver high quality sustainable safe acute services. To improve outcomes and optimise delivery of acute care and ensuring sustainability. Talks about establishing a way to unroll all the other things discussed in this area, as this is the only area without a vanguard. Investment. To be confirmed dependent on configuration. Core Programme 6 Mental Health Alliance. Aims to improve quality and capacity and access to mental health services in Hampshire and The Isle Of Wight. This will be achieved by commisioners, local authorities, third sector organisations and service users all working together. Investment 45m assumed to include partial funding of 5YFV additional funding required. The aim is to give patients control of their information and how it’s used, allowing them to manage their long term conditions . Also to build fully integrated health and social care record, to allow staff to access it from anywhere. Talks about reduced demand for estate, which will release surplus estate for other uses such as housing. The priority being to replace the worst estate. Flexible estate solutions that enable new care models toto b delivered, a core group of Hampshire and Isle Of Wight leads is in place. New models of care will include “health hubs”, these will provide extended access to an advanced range of services which will reduce the need for patients to travel to the main hospital. Increased mobile working and the digital and work force enabling teams will enable to staff to access bases closer to patients, reducing travel and increasing productivity. To Create a flexible workforce shared across geographical and organisational boundaries with extended skills to deliver core STP programmes. Creating health care roles more attractive to local people enabling a strong community workforce. Also wants to deliver a reduction in agency workers being used. And intends no growth overall in the workforce for 5 years. Enabling Programme 10 New commissioning Models. My Life a Full Life are delivering this on the island. Objective is to adapt our methods for commissioning health care, reduce unnecessary duplication of commissioning work. To facilitate the delivery of the STP, generate cost reductions on continuing healthcare and prescribing. “My Life A Full Life” delivering this on the IOW saving through reduced variation in prescribing practices. Starts by saying Partnership Behaviours will become the norm. Must ensure adequate time and resource invested in embedding the change needed. Also mentions that a Change readiness assessment will be conducted to outline baseline change rate of the STP. Engagement with patients voluntary and community groups, engaging staff, MP’s Councils. It also mentions there is Unlikely to be a formal consultation. To help the STP steering board Best practice portfolio (MoP) and programme (MSP) management frameworks are being established. If we do nothing there will be a financial gap of £577m by 2020/21. We’ll close it by transforming services and reducing overall system costs. Plans will require investment in new model of care we want to invest £59m in services to close gap. We need to invest in our infrastructure and access capital funds. New models of care and commissioning models needed to support networked provision services, requiring specialised commissioning to work closely with STP. HIOW system needs to deliver additional £63m savings still to be identified. Aim to maintain save levels of staff to same levels for 5 years. Could destabilise Current service provision. The document is very long and repeats itself a lot, I recommend reading it yourself, or at least going to the sections you are most interested in to read them in more detail. Some of the changes are good for the Island, people have crying out for the medical and social care records to be put together and accessible to all the different doctors/specialists we see. This will be a challenge as all the services currently use different systems, but it will make things run more fluidly and speed up services for people if it can be done. Also speeding up the process of people being discharged from hospital once they are ready to leave is a no brainer, every NHS Trust must be trying to achieve that one too. I’m concerned the parts about “Estate Management” seem to suggest that buildings and land are going to be sold off, we need to keep track of where and when this happening, and where the money actually goes. Workers at Harvest Stores, some under 18, were horrified and alerted police after findings the lenses hidden in a network modem and air detector. The Union Street store, which has been closed since Monday’s walk out, houses nearly 70 cameras but, as the room is not a designated changing area, legal lines have not been crossed by managing director Amin Din. The row emerged amid claims that Mr Din owes four staff thousands in unpaid wages. Store manager Karen Nicholson, who led the walk out, said: “We shut the shop as soon as we found the cameras and got the police in. “That is where staff got changed and nobody knew about these until Monday. We uncovered the cameras in the office on Sunday, where staff also get dressed, and then checked the staff room as we knew the number of cameras and microphones in the shop already. “We might have suspected this but it was still a massive shock. He monitors the cameras from home. “Police said that while it was morally questionable, legally he was in the clear. She added that officers were “amazed” at the number of cameras in the shop. Staff have also been left in the lurch as some are owed hundreds in unpaid wages from June. In total, four staff are yet to get just under £2,000 from the shop’s owner. They now face an anxious wait to see whether they will be paid this week. Despite being paid in full, supervisor Robert Taylor also walked out. With three young children to support, he may have to sell belongings to afford food. He said: “I’m putting together a list of things that I can afford to sell to pay rent. “We’re doing this so new staff don’t have to deal with the secrets and lies like us. After walking out, staff approached the Baker’s Union and Better than Zero who are now supporting them through an industrial action. “Karen, Robert and their co-workers will go all the way to get the pay they’re due. 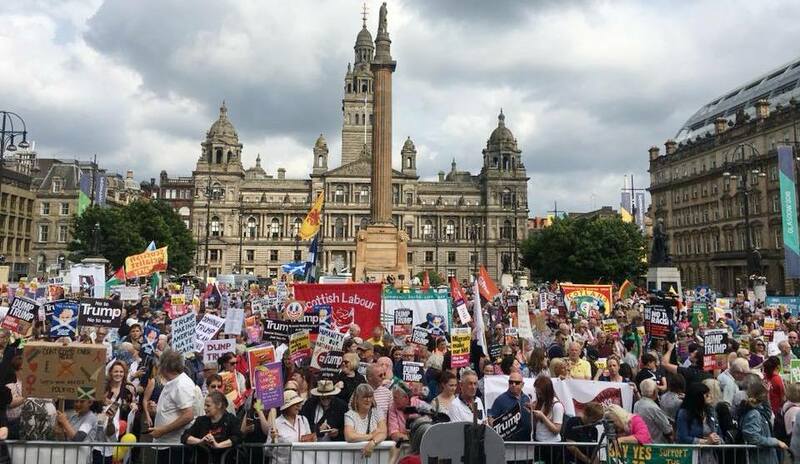 But this is about more than settling a wage dispute – by speaking out and joining the BFAWU union en masse, they are lighting a beacon for everyone in Glasgow whose pay and conditions are set at the mercy of the boss. Police also confirmed that they had attended the store on Monday morning over a problem with security cameras. When asked to comment, Mr Din said that the matter was a “stupid oversight” on his part. He said: “I hold my hands up and admit that I should have put signs up sooner. “Basically the staff entered and found cameras in the staff kitchen area and office. “It was not a changing area. The police confirmed that no law has been broken. They were installed by a reputable company. I can monitor these from home but they have not been working. “They were purely for security purposes so that if there were any issues I could look back. I just never got around to putting them up. There is a separate area for changing for staff in the toilet facility, with a separate sink. This was made clear. There are cleaning products everywhere. “The pay issue was resolved by the accountant and staff would have been paid in full on Monday. As the company is new, it hadn’t worked out. “Staff were not paid in full or on time. Every single staff member was asked before hand. We were late getting details to the accountant so there was a delay. The European Union (EU) is about to agree to a shared military industry fund which will give billions of dollars to military arms companies and exacerbate the global arms race. Presented as a key step to strengthen the EU and regain citizens’ trust, instead, it enshrines the renewed prevalence of national interests in a hard-security context, writes Laëtitia Sédou. The following report is provided by Laëtitia Sédou, programme officer of the European Network Against Arms Trade (ENAAT), which unites campaign and research groups from 13 European countries, as well as several international organizations. On May 22, the EU Parliament, Commission and member states reached a compromise on the European Defence Industrial Development Programme (EDIDP, the second and biggest pillar of the EU Defence Fund, which will finance the development of new weaponry in 2019 and 2020) after three months of negotiations behind closed doors. This compromise still needs to be approved by our Members of the European Parliament and national governments within the coming weeks. The EU Parliament asked for the 500 million euro budget to come from unallocated margins so as not to affect ongoing programmes, allegedly a red line for the Parliament. However, its negotiators ultimately accepted that 60 per cent (300 million euros) would be diverted from existing civilian programmes. Knowing that the initial proposal was 75 per cent diversion, this is far from a “success” and further discredits the EU Parliament in future negotiations on the next long-term budget, which foresees a disproportionate 13 billion euros for the Defence Fund. The EU Parliament negotiators also accepted that the Commission implements the programme without consulting the Parliament on concrete elements like the detailed priorities to be funded, contrary to usual practice in EU funding schemes. This is particularly problematic because the EDIDP is a pilot programme with no precedent, and the draft Regulation is unclear on the type of industrial developments that will be funded, apart from three vague and wide-ranging topics (mobility and energy protection, communications and intelligence, engagement and combat capabilities). Thus nobody really knows what type of weaponry will be developed with those 500 million euros coming from taxpayers’ money. Except maybe the military industry, which is over-influencing the Commission on those developments, and the member states who managed a de facto veto power within the traditional Programme Committee, under an unprecedented move compared to usual EU practices. Progressive Members of EU Parliament had won amendments for a clear exclusion of activities related to a list of banned or controversial weapons, including the development of fully autonomous weapons. Unfortunately, in order to get a deal at all costs, those amendments were watered down by the EU Parliament negotiators to a point where they have become meaningless. And member states’ fierce resistance against any clear and legally binding exclusion of controversial technologies like fully autonomous weapons is a worrying indicator that they want to be able to develop all kinds of military technology out of ethical considerations, in order to reach and maintain EU technological superiority over potential “enemies” or competitors. Such “strategic autonomy” is indeed one of the main objectives of the EU Defence Fund. Already, key countries such as France and Germany publicly stated that the development of “ready-to-arm” if not already armed drones, like the medium altitude long endurance (MALE) Eurodrone programme, should be among the first projects to be funded under the European Defence Fund from 2021. And the ongoing Preparatory Action on Defence Research (PADR, focusing on basic research, the first pillar of the Defence Fund) currently dedicates a third of its 90 million euros budget to a project for maritime surveillance through unmanned surface and underwater systems (Ocean 2020). Regarding exports, one the EDIDP main objectives is the global competitiveness of the arms industry, and “a positive effect on exports” is an expected result. Knowing that fragmented national markets are already too small to absorb European over-production and provide higher profitability, the arms industry will put an even greater emphasis on exports. To add on, member states want to protect their national military industry, leading to the introduction of financial incentives for small and medium-sized enterprises (SMEs) and middle-capitalization companies (Mid-Caps) in the EDIDP, as a way to reassure smaller countries. Rather than rationalizing the industry to resolve over-capacity, the Defence Fund will sustain non-competitive companies through subsidies. To sum up, new and advanced EU-funded military technology could be freely used by member states according to their geostrategic interests, and exported according to their own — disparate — arms exports policies, thus leading to a never-ending cycle of military developments needing further subsidies. Two out the six headings would be devoted to police, security and defence activities: one for “Migration and borders” and one for “Defence and Security,” integrating the Defence Fund. Moreover, the major budget increments would go to those two headings (together totalling 55 billion), with an astonishing 2,200 per cent jump for the Defence Fund from 0.59 billion to 13 billion euros to be provided to the military industry. But also a 180 per cent jump for security and a 260 per cent increase for migration and borders. Moreover, the security and defence sector is now mainstreamed and often a priority within several civilian programmes with important increases too, such as Erasmus+ and the EU Framework Programme for Research and Innovation. The latter has an important — yet civilian — focus on cutting-edge technologies and artificial intelligence as well as significant funding dedicated to research in the security area, mainly benefiting the industry. The current Preparatory Action and the coming Defence Industrial Development Programme give a clear indication of what the full-blown European Defence Fund will look like and aim at in the next EU long-term budget. Is that really what citizens are expecting from their leaders? 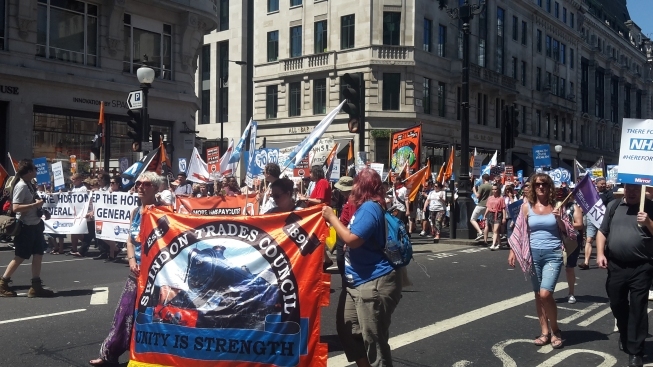 While NATO countries fight with the U.S. and amongst themselves over who will control Europe and dominate Asia, the movement of the peoples against imperialism and war saw hundreds of thousands of people take to the streets to oppose NATO’s 2018 summit in Brussels and U.S. President Donald Trump’s subsequent visit to England and Scotland. 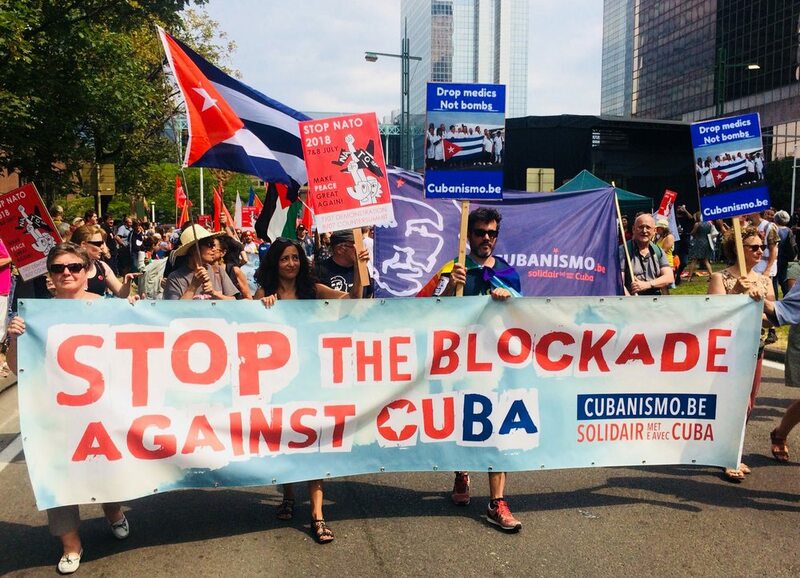 The people’s actions put their demands for peace and an end to aggression, war and occupation firmly on the agenda, including the dismantling of the aggressive U.S.-led NATO bloc. 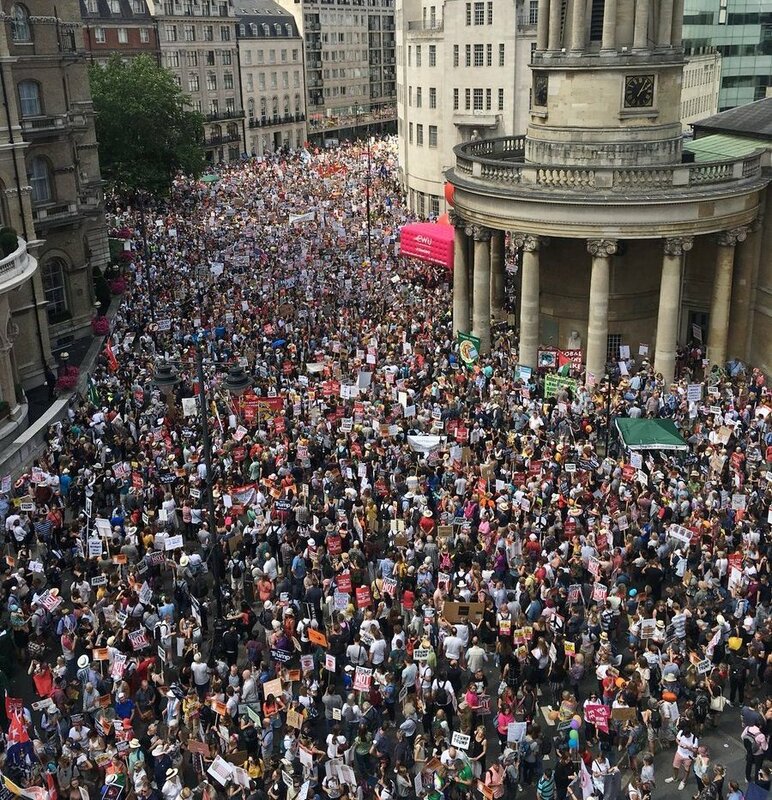 Mass demonstration against U.S. President Trump’s visit to London, July 13, 2018. Trump was kept away from London because of the massive opposition to his visit, reflecting the broad opposition to his reactionary stands and U.S. warmongering, as well as to the government of British Prime Minister Theresa May for inviting him. 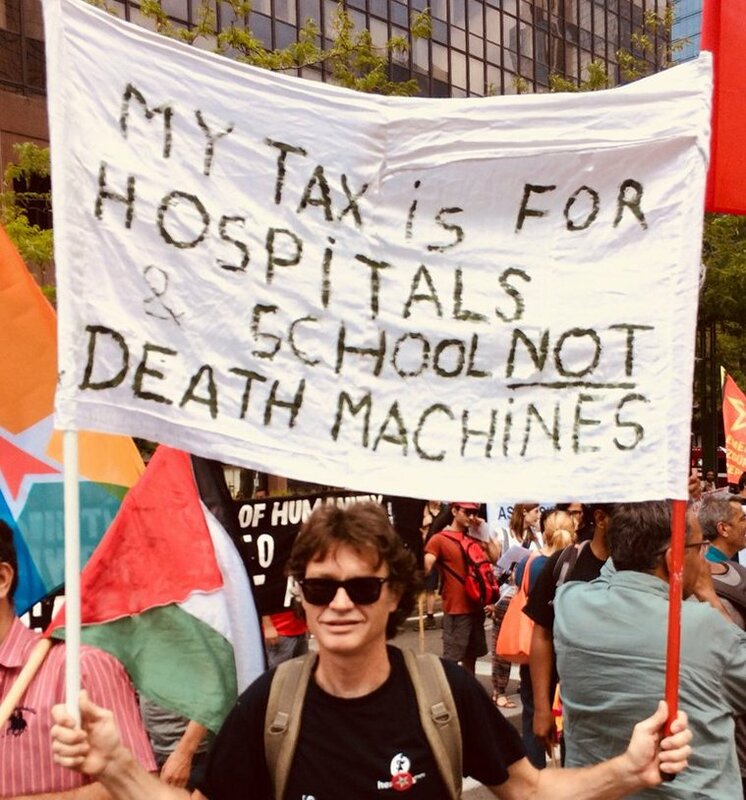 Demonstration in Glasgow, July 13, 2018. 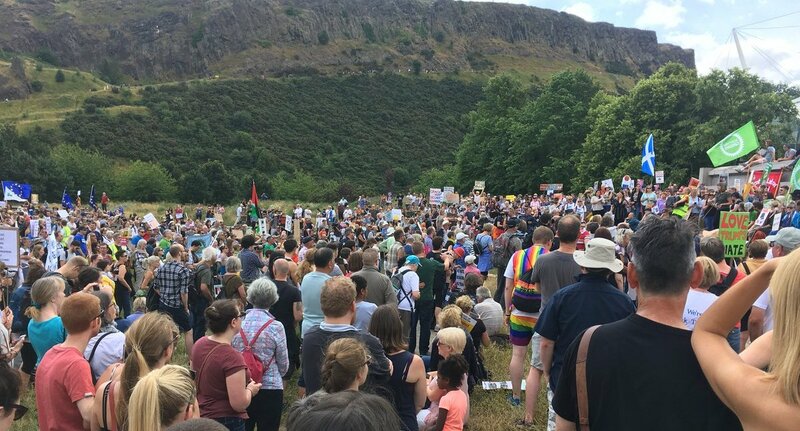 Ten thousand demonstrate in Edinburgh July 14, 2018 against U.S. President Trump’s visit. Trump went to Scotland to visit one of his golf resorts. NATO leaders claim that the NATO Summit held in Brussels, Belgium, July 11-12, met all its goals to increase war spending manifold and strengthen NATO’s stranglehold over eastern Europe and encirclement of Russia, stabilize NATO’s grip over Afghanistan and Iraq, and “protect Europe” from incursion of migrants from North Africa and West Asia. The U.S. exploited the contradictions between itself and the European big powers, as well as among the European powers, to favour its interests to “Make America Great Again.” This is to no avail since these contradictions will only deepen in the immediate future. In fact, the developments brought to the fore the famous dictum “Nations have no permanent friends and no permanent enemies, only permanent interests.” So long as this is the case, the interests of the peoples of the world and their sovereignty will be trampled in the mud. In this vein, on July 11, the first day of the NATO Summit, Trump began by reiterating the demand that all NATO members reach the two per cent of GDP target for military spending, but shortened the deadline to January 2019, six years ahead of schedule. By the end of the day, he declared that this figure should be four per cent. The next day, Trump threatened that if other countries do not meet the two per cent mark by the January deadline, he would “do his own thing.” The result was an emergency meeting called by NATO Secretary General Jens Stoltenberg. After that meeting Trump stated, “The commitment was at two per cent. Ultimately that’ll be going up much higher,” and he said Stoltenberg would provide the figures. NATO members besides the U.S. are reportedly planning to increase military spending by a combined total of U.S.$11 billion this year. In this way, the hooligan methods of the U.S. president once again succeeded in setting the agenda for a major summit with U.S. demands for increased war spending the reference point for the discussion, with all others responding to it and other U.S. demands. For Canada, Prime Minister Trudeau reiterated that Canada will not increase military spending at this time because in 2017 military spending was already increased by 70 per cent over the next decade. “The president has been consistent that he wants to see people spending more on defence in their countries and we are very pleased we are doing that,” Trudeau told reporters. “We’ll always step up, with cash yes but also with commitments and capacity. That’s what NATO is looking for.” He said that Canada has reaffirmed its commitment to work toward contributing two per cent of its GDP to military spending and to reverse any cuts. A similar response was given by other leaders. Even before the Summit began, the U.S. policy to control Europe by driving the agenda was clear when Germany was targeted by Trump and accused of being “a captive to Russia” because of the Nord Stream offshore natural gas pipeline that brings Russian gas to Germany through the Baltic Sea, bypassing a land route through Ukraine. The U.S. State Department warned European firms involved in the deal for the pipeline that the project could divide Europe and they were at risk of sanctions. This was met with hostility by German Chancellor Angela Merkel and German businesses who rejected U.S. dictate of European energy policies. The NATO Summit and related events provided occasions to once again spread lies about NATO, calling it an alliance for peace when in fact it is an alliance for aggression and war and always has been. Speaking at a press conference ahead of the Summit on July 10, NATO Secretary General Jens Stoltenberg said, “NATO embodies the bond between Europe and North America, which has kept our people safe for almost 70 years.” Far from it, it was part of the drive for war instigated by the Anglo-American imperialists after World War II initiated by Winston Churchill’s racist and anti-communist “Iron Curtain” speech delivered in Fulton, Missouri on March 5, 1946 and President Truman’s “containment of communism” policy. “We are an Alliance that exists to prevent conflict and preserve peace. We are an Alliance that constantly adapts to a changing world. Above all, we are an Alliance that delivers,” he said. To say that NATO has supported an international rules-based order for more than 70 or 75 years is self-serving and hypocritical. NATO was founded as part of the Cold War launched by the Anglo-American imperialists to oppose the Soviet Union and communism in order to make sure that, following World War II, the movement of the peoples of the world for lasting peace, freedom and democracy would not take hold. It was created, amongst other things, to make sure the denazification of Germany did not take place and, on the contrary, the Nazi machine was incorporated into the Anglo-American state agencies. Politically, countries such as Italy and France took up electoral systems aimed at blocking the establishment of a people’s power. So too Anglo-American imperialism enforced the division of Germany for the next several decades, blaming it on communism and refusing to reunify the country. The U.S. imperialists had previously used this method in Korea and Vietnam, while the British imperialists divided India, organised the fascist regime in Greece, atrocities in Indonesia and so on. Together the Anglo-American imperialists organised criminal covert activities to undermine the movement of the peoples for peace, democracy and freedom at a time peace was the greatest need of the peoples of the world and it could not be assured without the establishment of international democracy and the recognition of the rights of all nations, big or small, to determine their own affairs. The demand for national independence and democracy arose as the most important demand along with the demand for peace. The first aim of the peace movement was to fight against the split between the war-time allies and to push for their political unity in spite of ideological differences, that is for peaceful co-existence between countries with differing and opposite social systems. The peace movement was also directed against U.S. militarisation of the economy and warmongering and the militarisation of the world through military bases and military alliances. The peace movement put political considerations in first place, and peace emerged as the most urgent political question in the post-war period for everyone, irrespective of their ideological positions. Several days after Churchill delivered his infamous Iron Curtain speech, Soviet leader Joseph Stalin, in an interview with Pravda, stated that Churchill’s speech had unquestionably prejudiced the cause of peace and security. Churchill had taken the stand of the warmongers, and was not alone. He was calling for war on the Soviet Union. Stalin likened Churchill to Hitler and his friends, in setting out to unleash a war with a race theory, in Churchill’s case calling on the English-speaking peoples to decide and rule over the destiny of the world. Today the Soviet Union no longer exists but the role of bulwark against reaction and war continues to be the united action of the peoples of the world in defence of peace, freedom and democracy. It is up to the peoples of the world to hold in check the imperialists’ war drive. Just a few days ahead of the NATO Summit, on July 7 and 8 the World Peace Council (WPC) organized a conference in Brussels within the framework of its “Yes to Peace — No to NATO” campaign. The conference addressed how to strengthen the anti-imperialist-peace movements under the present condition. The participants came from anti-imperialist peace movements in: Belgium, Bulgaria, Cyprus, Greece, Italy, Nepal, Norway, Poland, Portugal, Serbia, Spain, Turkey and the USA. “There is no doubt that, as we have proclaimed, NATO was and is the enemy of the peoples and peace, the armed wing of imperialism, the dangerous murderous organization protecting the interests of capital at a global level; that it staggers its aggression against the peoples; that its contradictions and competitions lead to new wars and their possible generalization. From this point of view, the peoples’ struggle as a whole for its dissolution is an immediate priority. 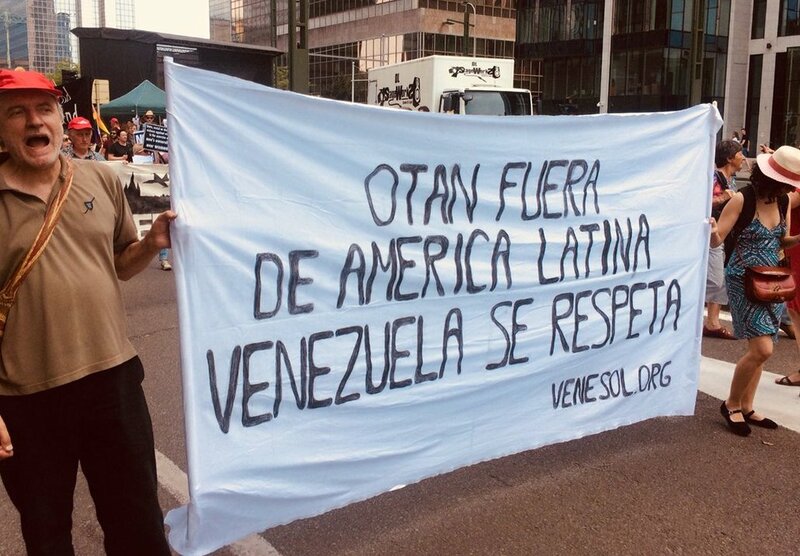 The peoples’ struggle in the NATO member countries for disengagement from it, as well as the denunciation of all the governments of the member states that participate and unanimously sign its decisions, is of special importance. There can be no doubt about this as well as about the character of the EU which, as an imperialist union, is working closely with NATO towards the same aim. 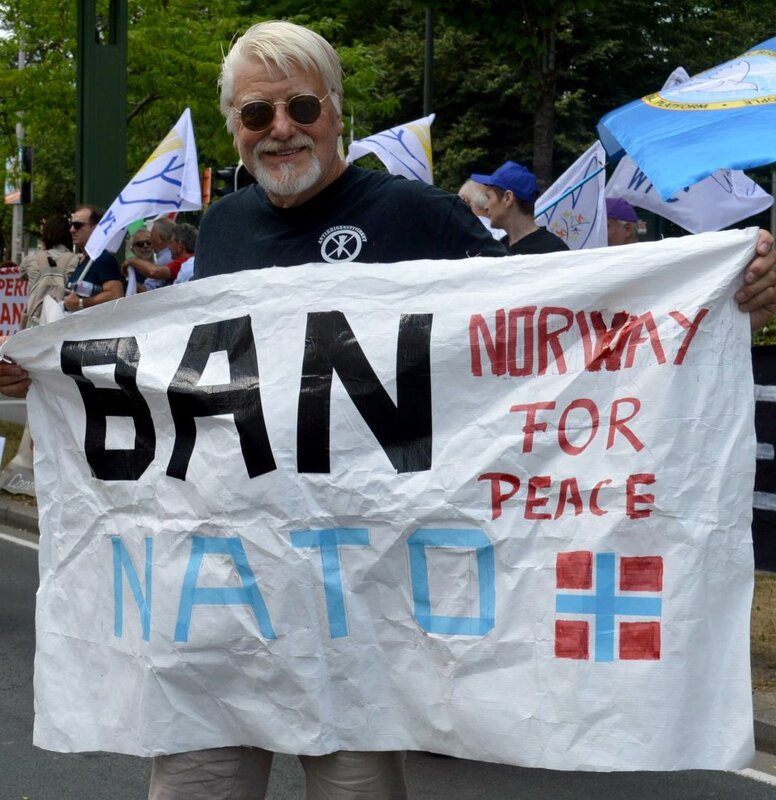 The “Norway for Peace” movement referred to NATO’s aspirations to dominate the North Atlantic and the Arctic. In Norway, there are U.S. naval bases, and a civil aviation airport is being refurbished to join NATO’s military force. Also, a NATO monitoring system (Globus 3) has been installed near the border with Russia. The November 2017 Radar Information Agreement between the U.S. and Norway allows information from Finland and Sweden to be available to NATO. A huge NATO military exercise — the largest since the end of the Second World War — will take place at the end of October in the Scandinavian region. There will be 35,000 troops from 30 countries, 150 fighter jets and 70 warships. Exercises will include Sweden, Finland and the Baltic countries and the scenario is that Norway is being attacked by Russia. The Bulgarian National Peace Council addressed the growing tension between NATO and Russia in the Black Sea, the growing NATO military presence in the region, and the strategic integration of the former Yugoslav Republic of Macedonia and other Western Balkan countries into NATO. The intensification of NATO’s military presence in Eastern Europe, the Balkans and the Baltic States, and the propaganda in the United States, was analyzed by the representative of the United National Antiwar Coalition from the U.S. The Milan Anti-War Committee’s representative underlined that Italy is a strategic point for NATO with military, naval, airborne and nuclear weapons across the country. NATO’s command is stationed in Naples; Sicily is the centre of NATO satellite telecommunications and drones that can operate around the world; in Sardinia there is a crucial base for military exercises and nuclear weapons tests, causing high cancer rates in the region. He denounced the Italian government for its military spending of 70 million euros per day, and for taking part in and implementing all NATO decisions. He referred to the Italian government’s role in the invasion of Libya, putting the country’s airbases at the disposal of this NATO aggression. Paula Polanco, President of the Belgian INTAL movement, underscored that the duty of the peace movement is to create strong movements in each country against NATO, the U.S. and the EU, and to link the anti-imperialist struggle to the struggle for social justice. She also demanded the withdrawal of Belgium from NATO. 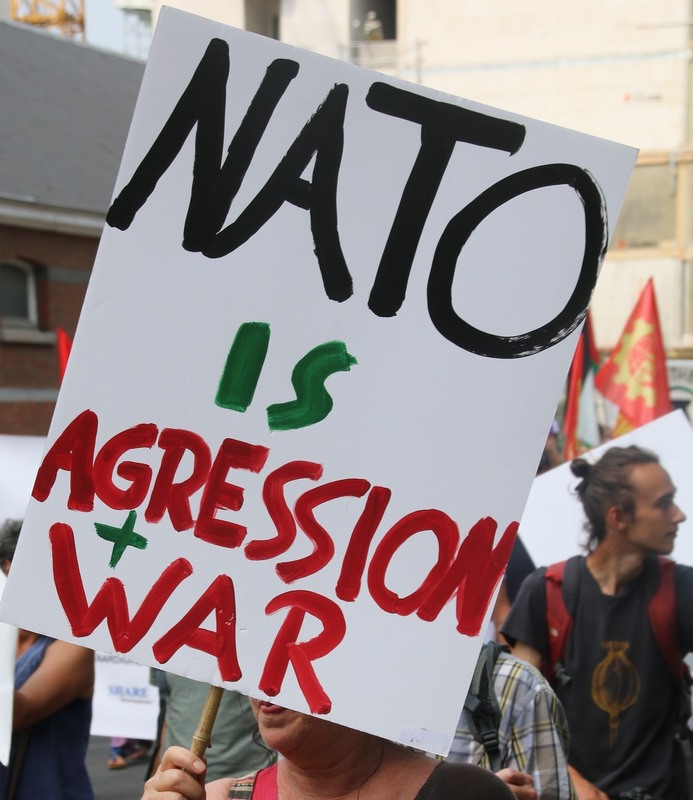 The Portuguese Council for Peace and Co-operation condemned NATO’s deadly imperialist activities, as well as the Permanent European Structured Co-operation (PESCO), demanding that the Portuguese Armed Forces not participate in NATO and EU missions. 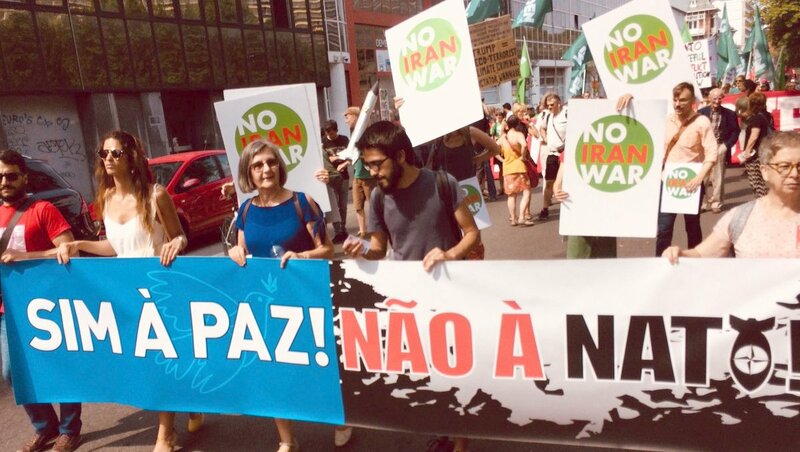 The WPC Campaign “Yes to Peace — No to NATO,” in which dozens of Portuguese organizations participate with events and the sharing of materials are spreading word of the need for a fight against NATO, the Portuguese delegate also reported. The representative of the World Federation of Democratic Youth (WFDY) stressed that since the first years of its establishment, WFDY has fought NATO’s actions and crimes, and that NATO’s history is full of interventions, coups and violent overthrows that have led millions of people to misery, death and displacement. “NATO’s plans, this imperialist war machine, is being condemned by many millions of people and youth in dozens of countries. We coordinate our action with our fraternal organization, the WPC, against the common enemy, imperialism, its mechanisms and plans. We express our militant solidarity with the just struggles of the peoples under occupation, imperialist threat and intervention,” he said. The representative of the Greek Committee for International Détente and Peace (EEDYE) called on the representatives of the other anti-imperialist peace movements to strengthen the struggle, “to close the Euro-Atlantic bases and headquarters, to leave our countries out of imperialist organizations and alliances, to express our solidarity to the peoples threatened by imperialism, military threats and interventions.” Only the organized struggle of the peoples to become the only sovereigns in their own countries and the owners of the wealth they produce, can guarantee real peace and social justice, the EEDYE representative concluded. The representative of the Peace Committee of Turkey stressed that it is important to emphasize the imperialist system and its instruments, such as NATO, instead of turning attention to individual leaders, giving the U.S. and its president as the example. It was also emphasized that imperialism is continuing to concentrate on Eastern Europe, the Balkans, Eastern Mediterranean and the Middle East and that the struggle for peace in these regions is especially important. 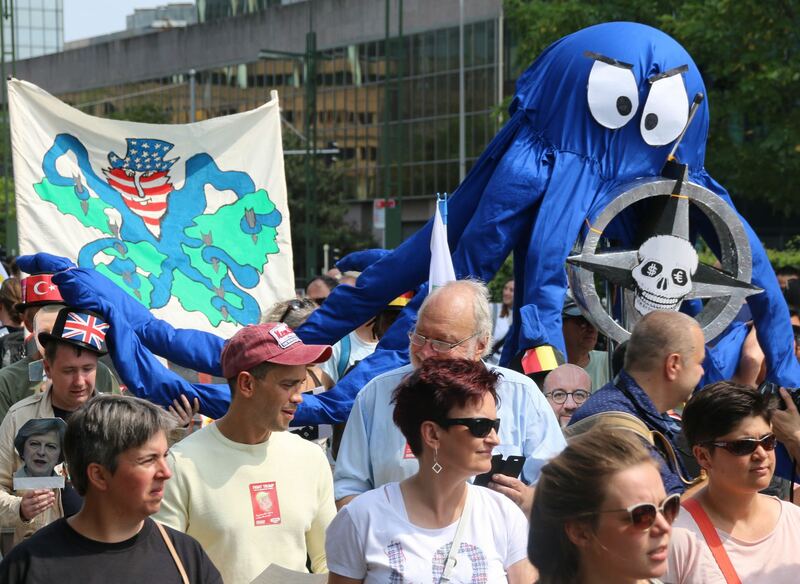 Following the conference, participants took part in the anti-NATO rally in Brussels. At least 3,000 people took part in the action. The U.S.-led RIMPAC 2018, the world’s largest naval manoeuver, began June 27 with German soldiers participating. According to the U.S. Navy, the naval exercise will also include operations in the Western Pacific. The region of the Southwest Pacific Islands will thus come into focus, which — even though largely ignored by the European public — has been gaining significant global influence. On the one hand, the influence of Western countries has shrunk recently, while that of their strategic rivals, such as Russia and China, has significantly grown. Some Pacific Island nations have since then been seeking to pursue a foreign policy independent from the West. On the other hand, the Southwest Pacific has become even more important also for Australia and the United States: as the political economic backyard for Australia and “gateway to the Indo-Pacific” for the USA. Germany is also attempting to increase its activities in the region. As the U.S. Navy had previously announced, the naval exercise will particularly focus on operations in the Western Pacific and will include the small Tonga kingdom, a state in the large island region of the Southwest Pacific. The region, which has recently been gaining significant global influence — even though largely ignored by the European public — will thus come into the sights of Western military strategists. Of the eleven independent nations, two partially self-administrated states and diverse colonies of the Pacific region, seven of the republics had been German colonies — a history largely forgotten: the Marshall Islands, Micronesia, Nauru, the Northern Mariana Islands, Palau, the Salomon Islands and Samoa. Only two of the Pacific Island nations, Fiji and Tonga, have their own militaries. For a long time following World War II, in addition to the traditional colonial powers Great Britain and France, particularly Australia, New Zealand and the USA, organized in the ANZUS pact played a dominant role in the region’s politics, economy and military. Over the past few decades, however, the Western powers have increasingly been losing influence in the Pacific — to emerging nations, such as Brazil and India, but also to their direct rivals, like China, Cuba, and Russia. Since the early 2000s, Cuba has had ties to almost all countries in the region and provided medical aid in particular. Physicians from the socialist republic are working in several Pacific Island nations. In 2003, the government of the People’s Republic of China had announced that it would expand its ties to countries of the Pacific Island Forum (PIF), which includes all islands of the region. In fact, during the years that followed, Beijing massively expanded its influence, above all, through credits and development aid. Russia is also expanding its presence in the Pacific. After the 2009 military putsch in Fiji, its new government was turning increasingly toward Moscow. Russian Foreign Minister Sergey Lavrov was the first senior Russian government official to visit Fiji in 2012. Four years later an extensive Russian arms shipment to Fiji aroused international attention. Following the military hardware, Russian military advisors arrived on the island. For Western strategists, this was a severe setback. In fact, the growing non-Western influence is allowing several of the Pacific Island nations to attempt a foreign policy more independent from that of the West. This can be seen in minute details, hardly discernable to superficial observers. For example, between 2009 and 2011 Nauru, Tuvalu, and Vanuatu recognized the independence of the separatist regions of Abkhazia and South Ossetia from Georgia — a setback not only for Western-oriented Georgia, but also for the western countries themselves, including Germany, which still strictly refuse to recognize both regions’ independence. Tuvalu and Vanuatu, however, under massive pressure from the West, rescinded their recognition. After Crimea joined the Russian Federation in 2014, five of the Pacific Island governments refused to condemn this as an “annexation in violation of international law” — as the West does. In 2015, police officers from Vanuatu marched, for the first time, in China’s capital Beijing’s celebration parade commemorating the 70th Anniversary of the end of World War II in Asia. As an open reprisal to their pursuit of an independent foreign policy, the U.S. Congress passed a law last year, threatening to apply sanctions to countries recognizing Abkhazia and South Ossetia’s independence. This would affect Nauru. In spite of the pressure from Washington, the Nauruan government is remaining steadfast in its position — and in January, received, for the first time, the South Ossetian foreign minister. In April rumours began to spread that the Chinese military would be allowed to open a base on Vanuatu, which both countries’ governments deny.Experts nevertheless maintain that a military presence on Vanuatu, in the long run, could be a strategic option for China. Accordingly, Western powers are beginning to intensify their influence activities in the southwestern Pacific. In early June, at the Shangri-La Dialogue in Singapore — a sort of Asian Munich Security Conference, where top German politicians have also been participating over the past few years — the U.S. Secretary of Defense James Mattis announced the U.S. would be expanding its activities in the Pacific Rim countries, declaring that the region is “America’s gateway to the Indo-Pacific.” The governments of at least some of the countries in the region, show themselves to be receptive, in principle, to all sides. “We welcome anyone who supports us, because we can really use any help we can get,” the Minister of the Economy of the Fiji Republic, Aiyaz Sayed-Khaiyum, told the German press in early June. Whether that help comes from Australia, Germany or China, is unimportant to his country. In fact, besides the United States, it is particularly the Australian political establishment that is again showing an increased interest in the southwest Pacific. As Peter Jennings, Executive Director of the Australian Strategic Policy Institute (ASPI), explained, the region needs “more Australian leadership.” If necessary, Australia must also engage its military. The ASPI is co-financed by Australia’s Defense Ministry. Leading associates of the think tank have taken part also in the Körber Foundation’s Bergedorf Round Table. Australia is the Federal Republic of Germany’s traditional regional ally. Since 2016, Berlin has been engaged in a regular dialogue with Canberra at the foreign and defense ministry levels — also to reinforce Berlin’s standing in the Pacific realm.Last year German business associations were calling for entering free trade agreements with Australia and New Zealand. Last, but not least, beyond its cooperation with Australia, the German government now wants to expand its influence in the Pacific realm which is rapidly growing in importance — also by reinforcing its development aid. 2. The states are: the Cook Islands (not independent, associated with New Zealand), Fiji, Tonga, Tuvalu, Kiribati, the Marshall Islands, Micronesia, Nauru, Niue (without diplomatic relations with Germany, not independent and associated with New Zealand), Palau, Samoa, the Solomon Islands and Vanuatu. In addition, the Commonwealth of the Northern Mariana Islands is still a U.S. colony. 3. The ANZUS Pact, founded in 1951, is the equivalent to NATO in the South Pacific. Since 1986, New Zealand has been partially suspended from the pact, as the government at the time declared the country wants to be free of nuclear weapons and nuclear power. 4. “China announces initiatives to expand ties with PIF member countries,” pg.china-embassy.org, November 24, 2003. 5. Lucy Craymer, “China Seeks to Star in South Pacific,” wsj.com, April 27, 2012. 6. Ben Doherty, “Secret Russian arms donation to Fiji raises concerns of bid for Pacific influence,” theguardian.com January 22, 2016. 8. “Tiny Pacific Nation of Vanuatu to Join Motley Crew at China’s WWII Anniversary Parade,” time.com, September 1, 2015. 9. Maximilian Hess, “Congress Pushes Tougher Line on Russia,” intersectionproject.eu, July 6, 2017. 10. David X. Noack, “Signal an die Großen,” junge Welt, January 27, 2018. 11. Dan McGarry, “Baseless rumours — Why talk of a Chinese military installation in Vanuatu misses the point,” theguardian.com, April 11, 2018. 13. “Sorgen um Chinas Vordringen im Westpazifik,” Frankfurter Allgemeine Zeitung, June 4, 2018. 14. “Uns ist gleich, ob die Hilfe aus China oder Deutschland kommt,” Frankfurter Allgemeine Zeitung,June 4, 2018. 15. Peter Jennings, “Leadership requires courage in the Pacific,” aspi.org.au, April 14, 2018. 16. “About Us,” aspi.org.au [ohne Datum]. 17. Teilnehmer des 154, Bergedorfer Gesprächskreises “Frieden und Sicherheit in Asien-Pazifik,” Jakarta, 1-3, November 2013, koerber-stiftung.de [ohne Datum]. 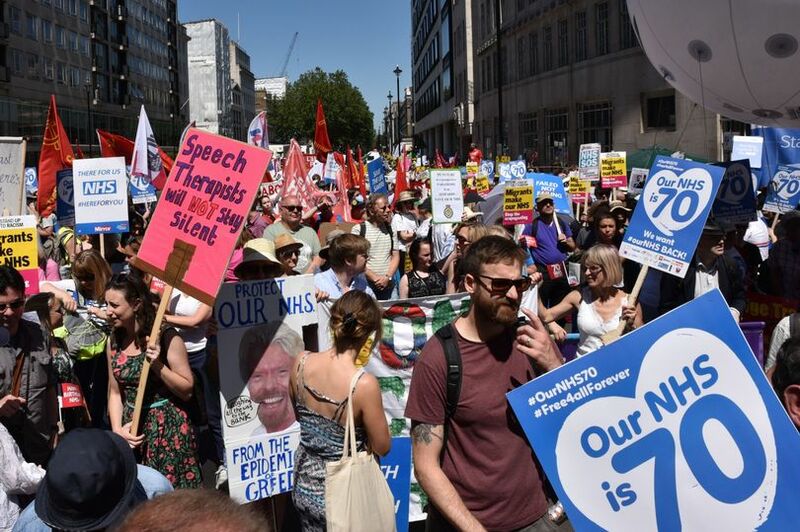 On June 30, tens of thousands of ordinary people marched through London to mark the 70th anniversary of the NHS and to condemn its privatisation. The overwhelming sentiment was expressed in the principle that health care is a right. 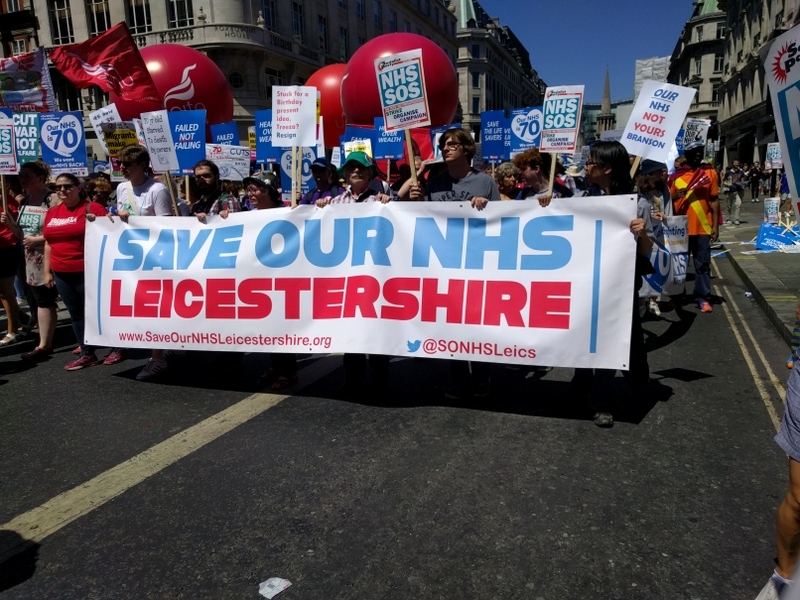 Many local campaigns, which are the backbone of the resistance to dismantling the NHS, participated, and nurses, doctors and other health workers led the demonstration. 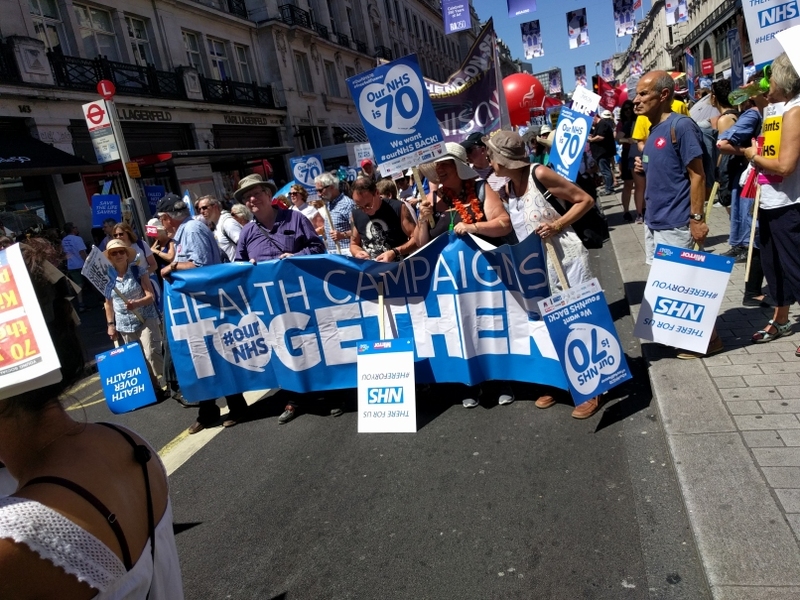 The NHS 70 demonstration thus celebrated the principles underlying a National Health Service, as well as condemning its brutal underfunding and privatisation. 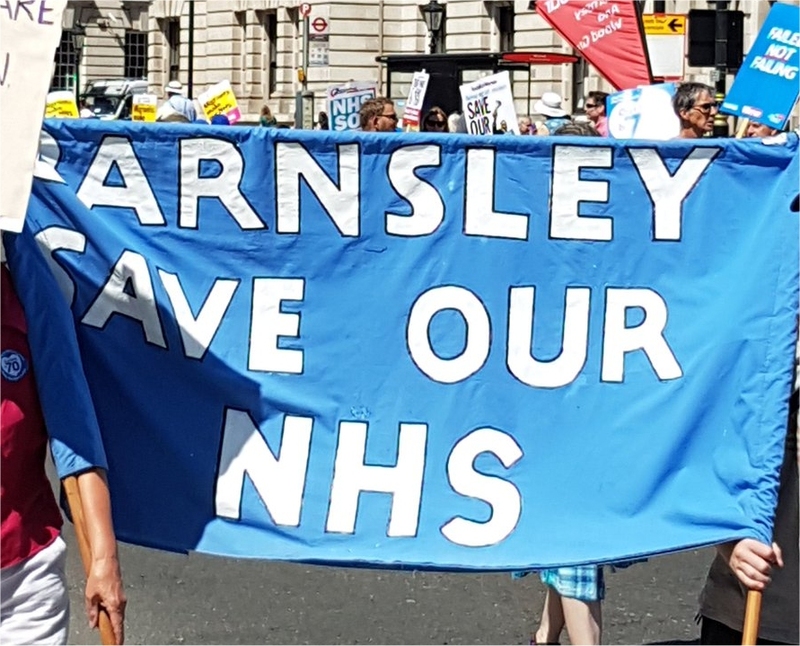 The movement to safeguard the future of the NHS will certainly continue, as the movement to resist the closure of services is built. A new direction is called for, whereby people and staff are in control. 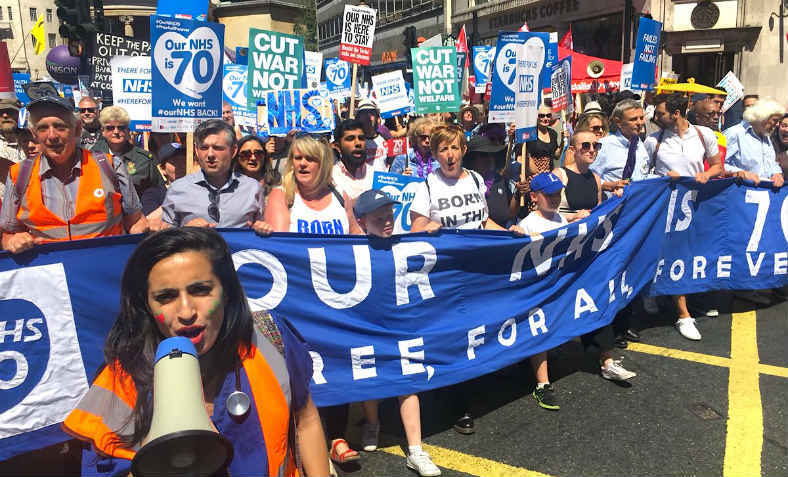 It was this fight that inspired many on the demonstration and will continue to inspire all who are resisting the destruction of the NHS.